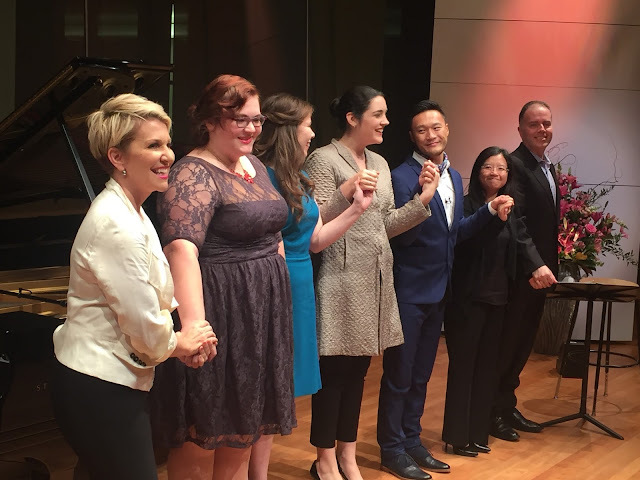 Joy in Singing has been celebrating art song for six decades, supporting young singers with master classes and competitions and bringing emerging artists to the public by means of recitals. The big news is that this non-profit foundation, founded by Winifred Cecil, is expanding its activities and will have master classes open to the public, additional SongSalon evenings in private homes (program directed by Maria Fattore), and increased educational and community outreach. Song lovers take note and keep yourself informed by visiting their website-- www.joyinsinging.org. Start thinking about what you may take from them and also what you might have to contribute. 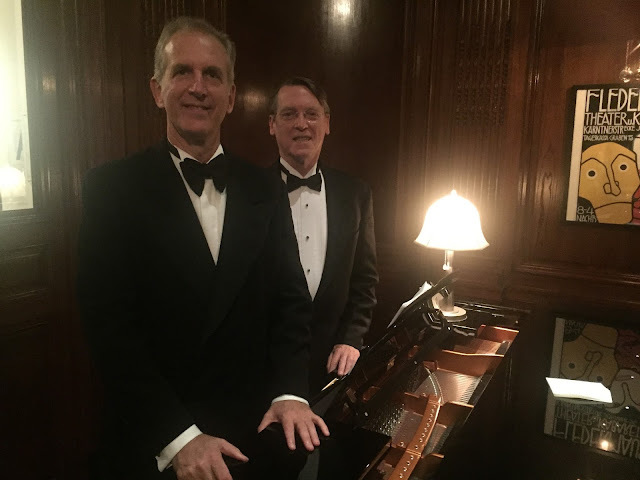 We have been privileged to attend several of their events and are always thrilled to hear artists that we might have otherwise not heard, artists of exemplary quality. Last night at Merkin Concert Hall we had exposure to two artists that we actually had heard before but we heard them in a new light. Soprano Marie Marquis was seen and heard this past Halloween as part of Heartbeat Opera's concert of Mozart in drag (Queens of the Night), the review of which can be read by scrolling down a month's worth of reviews. Collaborative pianist Jason Wirth conducted Dido and Aeneas from the harpsichord for Utopia Opera, the review of which is also archived. Both of these companies are among our favorites. Ms. Marquis lacks nothing. Not only is she a major vocal talent but she has the beauty and poise to grace any stage. Her self presentation is that of a confident young woman with a natural elegance but no pretensions. Her presence is a warm and engaging one; she makes ample use of her expressive face but reserves her gestures for emotional moments that count. It is difficult for us to get a good feel for a singer's instrument when they sing contemporary music in English so let us jump right to the encore, a song we know well and always love--Hugo Wolf's "Auch kleine Dinge", sung in fine German and with the requisite charm. We could not have asked for a better performance. The final set on the program comprised some highly passionate songs of Sergei Rachmaninoff, Six Romances, Op.38, the very last of his output of 85 songs. Rachmaninoff was at the top of his form here, offering powerful writing for piano and sensitive writing for the voice. Ms. Marquis and Mr. Wirth interpreted these masterpieces quite beautifully. "At Night in my Garden" has spare writing for the piano and evocative writing for the voice with the minor key giving it a mournful feel. In contrast, "To Her", a song of yearning for an absent beloved, enjoyed lavish writing for the piano. The final song "A-oo"
has the same theme and the intense longing was conveyed by both voice and piano. Two of the songs involved more cheerful coloration--the familiar "Daisies" with its rapid piano figures and "Ratcatcher" which gives the piano some frisky syncopated rhythms as it portrays the romantic piper. "Dream" was appropriately ethereal and gave Ms. Marquis an opportunity for a short but lovely portamento close to the end. Francis Poulenc's cycle La Courte Paille is filled with whimsy. "Le Sommeil", a gentle lullaby, was sung with consummate sweetness and "Quelle Aventure" conveys the wonder of childhood with wide leaps that Ms. Marquis negotiated with finesse. Our favorites, however, were "Les Anges Musiciens" with its beautiful imagery and the clever "Le Carafon", which made us just want to say "AWWWW". "Lune d'Avril" expresses an anti-war sentiment and Mr. Wirth's piano went from forceful to peaceful. Dominick Argento set texts from the Elizabethan era for his Six Elizabethan Songs and we think the poetry should have been left alone. The rhythm of the English language seems to dictate a vocal line that is not particularly melodic. Clearly Ms. Marquis chose these songs because she loves to sing them but we did not love the listening experience. Neither did we care for the French Renaissance poetry set by Wilhelm Killmayer in his Les Blasons Anatomiques du Corps Feminin, but we loved the sound of the old French and the way Ms. Marquis sang it. Just as we are very unhappy when a poor singer maims a song we love, so we can be made happy when a good singer shows us something worthwhile in a song we don't love! Another of Mr. Killmayer's compositions made an appearance on the program--yet another setting of Heinrich Heine's famous poem "Die Loreley". Was he trying to outdo Franz Liszt and Clara Schumann whose settings capture different essences of this German fairytale? We do not know, but several dozen other composers have also tried their hand at it. We failed to see what Killmayer's attempt achieved. John Masefield's "The Seal Man" reads like an interesting scary story but not exactly poetry and not offering much for composer Rebecca Clarke to add. The words get lost at the upper register which is a problem for almost all writing in English. In this genre, we far preferred Claude Debussy's setting of Leconte de Lisle's poem "Les Elfes". Ms. Marquis' facility with French--not just the pronunciation but the rhythm of the phrasing--ensured a more delightful experience of the macabre. What a perfect partnership! 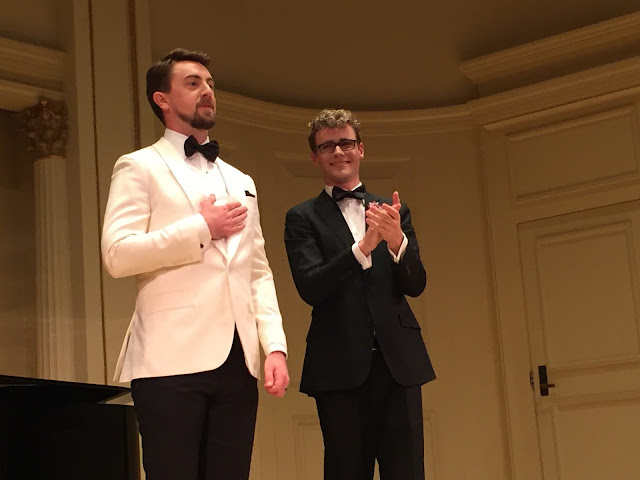 Tenor Ben Bliss and collaborative pianist Lachlan Glen met each other at the Lindemann Program and the rest is history. 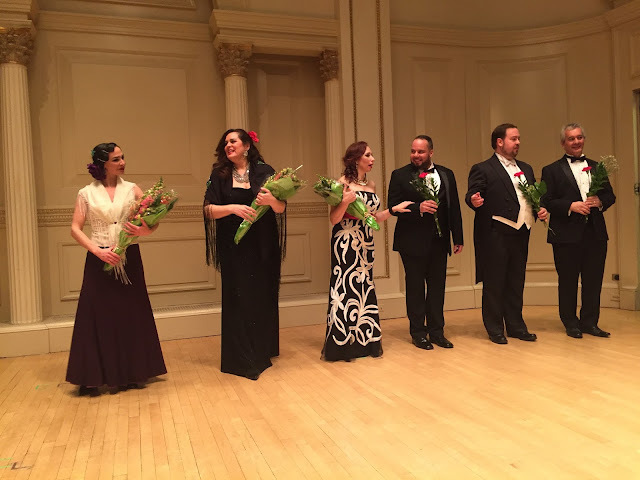 Last night at Weill Recital Hall of Carnegie Hall we experienced the final event in their tour but we wouldn't be at all surprised if the first night of the tour was as polished. The pair have an ease of working together and an equivalence of prodigious talent. We have reviewed their recitals on prior occasions and are always overcome by their level of artistry and professionalism. Mr. Bliss addresses the audience with such ease that one feels as if you are a guest in his home hearing tidbits about the composer and the song. In everything he does, his musicianship stands out. Nothing gets short shrift and so-called "popular music" gets the same attention as cherished classics. Mr. Glen is nothing if not colorful but musical values are never sacrificed at the altar of showmanship. His support for the singer is constant from moment to moment. Mr. Glen is also a consummate soloist, as evidenced by his recent recording (Embraceable You) which tackles standard piano chestnuts like Beethoven's Moonlight Sonata and Debussy's Clair de Lune; but just listen to his improvisations on Chopsticks! The program seemed to comprise a wide range of styles and each piece seemed to be one that the artists truly enjoyed performing. This was quite different from a recital given over to one composer, or a recital attempting to show off the singer's linguistic skills. This one was just things the artists love. Fortunately, we loved them too. We can never hear enough Strauss and Mr. Bliss serenaded us with "Ständchen" bringing this tender tune to a passionate climax. Mr. Glen's rippling piano and peaceful postlude were perfect. In "Barkarole", Mr. Glen really rocked the boat while Mr. Bliss gave us the sweetest "süsser" we have ever heard. His pianissimo was incredibly delicate with no loss of tone. The meditative "Morgen" observed a slow tempo and the final "stummer Schweigen" hung in the air for the lovely postlude. We were introduced to a composer previously unknown to us and are grateful for the introduction. Composer Nadia Boulanger had a younger sister named Lili who died tragically at the age of 24, leaving behind some gorgeous songs. At the tender age of 19 she won the Prix de Rome for her compositions, the first woman composer to have achieved this honor. We heard selections from Clairières dans le ciel, a fragrant setting of Francis Jammes' text. Mr. Bliss' performance was marked by finely floated top notes as Mr. Glen's piano rippled underneath. The French seemed flawless. This delicacy was succeeded by the robust "Marechiare" by Paolo Tosti, sung in Neapolitan dialect and given an expansive and powerful reading by the two artists. Talk about fragrant! You could smell the garlic! The recently deceased music critic John Gruen set some playful poetry by e.e.cummings to some equally playful music. We enjoyed the whimsy of "Spring is like a perhaps hand" and "Lady will you come with me into". The works were unpublished and we hope that situation will change. More people should hear these delightful ditties but we are not sure another duo could have brought them to such enchanting life. Our favorite contemporary composer Lowell Liebermann set a text by Henry Wadsworth Longfellow which was entitled "The Arrow and the Song", drawing an analogy between the two. The arrow is found long afterward in an oak tree, while the song lands in the heart of a friend. There was a grandness to this song and it did indeed reach our heart. Robert Frost's "Stopping by Woods on a Snowy Evening" was given a lovely setting by Ned Rorem in which the music was quietly pensive as sound can be when muffled by snow. Theodore Chanler's "I Rise When You Enter" is a charmingly lighthearted paean to love which Mr. Bliss sang with personality to spare. There was a set of Benjamin Britten songs as well; we like him best when he embraces humor and Mr. Bliss did complete justice to "The Children and Sir Nameless", an ironic depiction of a pompous lord who gets his comeuppance. In the melancholy "The Last Rose of Summer", Mr. Glen brought out the troubled chords in the piano and Mr. Bliss made the most of the melismatic passages, as he did in "The Choirmaster's Burial". There was some gorgeously spun out tones in the decrescendo passages. The final set comprised the aforementioned "Nature Boy" which is still circling our brain and haunting our soul, Harold Arlen's "One for My Baby" and Ray Charles' "Hallelujah I Love Her So". We were inspired to listen to Nat King Cole's recording of the first, Frank Sinatra's rendition of the second, and Ray Charles' performance of the third. We decided that Mr. Bliss' "cover" surpassed the originals of the first two but maybe, just maybe, Mr. Charles had a slight edge on the third! Two encores were offered. The first was "Una furtiva lagrima" from Donizetti's L'Elisir d'Amore when Nemorina realizes that he has won Adina's love. The heartfelt aria is perfect for Mr. Bliss' warm and flexible tenor. The second offering was "Maria" from Bernstein/Sondheim's West Side Story, another joyful celebration of first love. So! Blissed out are we by this recital! A recording of favorite songs by Mr. Bliss and Mr. Lachlan is available on Mr. Bliss' website. If you missed this landmark recital you can still enjoy some incomparable vocal music by this versatile duo. VHRPL! is enjoying their third season and we are a bit dazzled by their growth as a company. Founder and Artistic Director Alyce Mott has successfully shepherded the fledgling company in such a successful manner that the audience for Victor Herbert's masterpieces is growing by leaps and bigger leaps. This is due partly to her diligent efforts to improve upon the original and partly to her assembling a superb group of singers who can act. Last night's performance of The Princess Pat was a huge hit and, for the first time, libretti were provided--great to take home and re-read. A chamber orchestra is coming up next! Although we love William Hicks' piano accompaniment, it will be wonderful to see what Music Director/Conductor can achieve with an orchestra. The Princess Pat premiered a century ago but continues to delight with the freshness of Herbert's melodies and its romantic plot. The work had over 150 performances at the Cort Theater. The book and original lyrics were by Henry Blossom but Ms. Mott rearranged the order of the musical numbers and rewrote the libretto for this performance to make the characters more relatable--and directed it as well. And directed it well! We'd say her efforts were wildly successful! The story might just as well have been called The Fixer because the central character appears to be one Bob Darrow (Brian Kilday) who solves all the problems of the other characters. Lovely young Grace Holbrook (Sarah Caldwell Smith) is about to be married off to the wealthy widowed womanizer Anthony Schmalz (David Seatter) who is a German parvenu with a heavy accent; the reason is that her uncle, the amusingly befuddled General John Holbrook (Richard Holmes) has recently lost his fortune. Holbrook's son Tony (Drew Bolander) is a bit of a slacker who needs a good woman to set him straight; can you guess whom that might be? Fixer Bob is full of plots and devices to get her married to the right man. Grace's best friend Pat (Angela Christine Smith) is troubled by conflict with her husband, a jealous and possessive Sicilian Prince Antonio Di Montaldo ( Jason Robinette) . She was unhappy in Sicily and missed her Long Island home, her dogs, and her horses. Now they have returned to L.I. and he is unhappy. She feels neglected and it's up to Fixer Bob to restore their love. The work is filled with humor, much of which is provided by the servants and friends. Joanie Brittingham portrayed Marie, Grace's French maid, and Nathan Baer played Thomas, Holbrook's butler. Friends provided the excellent chorus--Tanya Roberts, Merrin Lazyan, Pedro Coppeti, Matthew Billman, and the double-cast Ms. Brittingham and Mr. Baer. Further humor was derived from the local constable Si Perkins (Anthony Maida) who couldn't believe that people dine at such a late hour. He too had to be appeased by Fixer Bob. We enjoyed the dancing, choreographed by Emily Cornelius, but we adored the singing. The duet between Princess Pat and her husband "All For You" was enchanting. Anthony's solo "I Wish I Was an Island in an Ocean of Girls" was a hilarious portrait of an aging lecher; the lyrics are clever as can be. A duet between Grace and Pat "For Better or for Worse" deserves as much fame as "The Flower Song" from Leo Delibes' Lakme. Perhaps that inspired Herbert to blend two female voices so magnificently. Si's song "The Shoes of Husband Number One as Worn by Husband Number Two" was not only hilarious but insightful. The male chorus was excellent in "Let's Drink One Toast", led by the General and the Prince. And finally, we loved the romantic "Neapolitan Love Song" sung by the Prince--partly in Italian. Perhaps Herbert was influenced by Tosti who died at just about the time this work premiered. Ms. Mott's direction was excellent, as it usually is; Mr. Thomas' conducting worked along with her direction to keep things moving at a rapid pace. This work was part of VHRPL! 's Irish season. Watch out for more to come! Labels: Angela Christine Smith, Anthony Maida, Brian Kilday, David Seatter, Drew Bolander, Jason Robinette, Joanie Brittingham, Nathan Baer, Riichard Holmes, Sarah Caldwell Smith, VHRPL! Evenings of classical music offer many delights but transcendent moments happen but occasionally and produce feelings of incomparable bliss. We experienced just such a moment last night at the German Forum concert at the intimate Bruno Walter Auditorium at Lincoln Center. The special moment occurred when tenor Gerard Schneider was singing Richard Strauss' "Allerseelen". The poet tells of the sole day of the year when one gets to reunite with loved ones who are no longer on this earth. Mr. Schneider sang it with a depth of feeling that leapt right from his heart to ours. It was the the kind of connection we dream about and what every singer longs to achieve. Our eyes brimmed with tears. By contrast, he sang Strauss' "Zueignung" with a blend of tenderness and passion that was thrilling to hear. Here is a tenor well on his way to superstardom who knows exactly how to use his gorgeous instrument. He also sang selections from Schumann's Dichterliebe with great control of dynamics and color, soothing the sore ears we got from enduring a recent awful performance, one we declined to write about. And if one wanted something lighter, he gave us "Dein ist mein ganzes Herz", the well known aria from Franz Lehar's Land des Lachelns; he sang it ardently and we were completely enraptured. "Ach, so fromm" from Friedrich von Flotow's Martha was sung with the tender tones of love. Soprano Jardena Fluckiger has a lovely pure tone and entertained us with some of our favorite songs by Hugo Wolf, selected from his Italienisches Liederbuch. She has an expressive face that complements her voice, and when she employs bodily gesture it adds a fine dimension to her performance. We always love the racy "Ich hab in Penna einen Liebsten wohnen" and, after the punchline, Babette Hierholzer's piano contributed the most delightful postlude. Ms. Fluckiger gave us some impressive coloratura singing in "Quel guardo" from Gaetano Donizetti's Don Pasquale. The embellishments were well handled and there was a particularly fine trill. Compared with the bel canto fireworks, the two songs by Claude Debussy from Quatre chansons de jeunesse seemed a bit pallid and wanted more color. Rounding out this superb program was music for violin and piano, performed by Ms. Hierholzer and concertmistress of the Juilliard Orchestra Mariella Haubs, who deserves all the accolades she receives. She was playing a Peter Guarneri violin from 1721, loaned by The Juilliard School, and what a sound came from this instrument! Ms. Haubs is beautiful and glamorous but if you close your eyes you would believe it was someone very very famous and of more advanced years. The star number was the first movement of Beethoven's Kreutzer sonata, the presto section of which is forceful and technically demanding of both pianist and violinist. The two artists rose to the occasion to such an extent that we wanted desperately to hear the rest of the sonata but, alas, it was not on the program. Instead we heard "Winter" from Antonio Vivaldi's The Four Seasons, a seasonal selection in which we could hear the snowflakes falling. Also on the program was Mozart's Sonata in F Major with its rapid fire triplets. The evening ended with two selections from Lehar's Die Lustige Witwe. First, Mr. Schneider sang the role of Camille, Count de Rosillon, inviting Valencienne (Ms. Fluckiger) to a romantic rendezvous in a pavilion. Then we heard "Lippen schweigen", the Act 3 duet between Hanna and Count Danilo, accompanied by violin and piano. The German Forum, helmed by President Henry Meyer-Oertel, provides performance opportunities for artists from German speaking countries and has a loyal and devoted following. Many of the members share a passion for German composers and, naturlich, the singers sing German the way it should be sung. Their events are always major treats! Those who read our opinions know how highly we esteem the versatile collaborative pianist Ms. Hierholzer. Watch out for the next event! Readers will recall that we are truly a fan of zarzuela. Listening to this afternoon's recital at Weill Recital Hall we felt as if we were offered a delicious and tempting succession of tapas. It was completely satisfying but we cannot stifle our desire for a full meal, i.e. a full-length production of a zarzuela, complete with scenery. Zarzuela is the Spanish counterpart of German singspiel, French opera comique, Italian opera buffa, and American musical theater. They involve highly dramatic stories and magnificent music--tuneful and memorable. The Spanish language is splendidly singable with its open vowels. 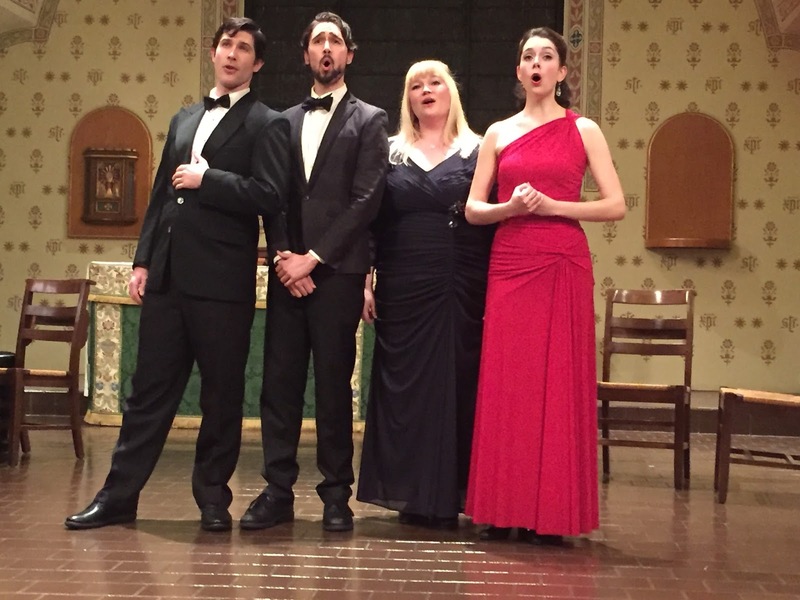 The four singers we heard are well known in operatic circles, especially abroad. 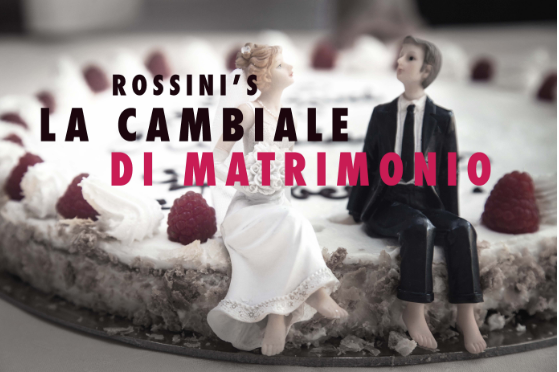 Soprano Rosa D'Imperio has a compelling presence onstage and a bright flexible soprano well suited to the material. Mezzo-soprano Anna Tonna delights with the warmth of her tone and ability to relate to the audience. Tenor Miguel Borrallo has a sweetness of timbre that makes him the perfect romantic hero and baritone Ricardo Rosa has a sizable size that fills the hall with sound. As if this were not enough, dancer Elizabeth Torras Aguilera treated us to dances in several different style with appropriate costuming to match. In "Fandango" by Luigi Boccherini, an 18th c. Italian composer, she danced in an early style that we have witnessed in dance companies specializing in the Baroque. The steps are graceful and courtly. We enjoyed the guitar accompaniment of Francisco Roldan. For the flamenco-inflected "Asturias" by Isaac Albeniz, she rocked a red gown with a long train manipulated by kicking, accompanying herself with castanets. The softness of her wrists was impressive, as was the percussive footwork. In the final number on the program "Mazurka de las sombrillas" from F. Moreno Torroba's Luisa Fernandez, she carried a beautiful lace parasol giving herself a lighter than air impression. .
Accompanist for the program was Maxim Anikushin. He opened the program with solos by Ravel and Shostakovich ("Aborada del Gracioso" and "Spanish Dance". It is no secret that Spanish culture has inspired French and Russian composers, among others. His playing is forceful but the strength of the singers vocalism never allowed him to overpower them. Among so many splendid selections, it is difficult to choose our favorites! In Ruperto Chapi's "Porque de mis ojos los tuyos retiras?" from La Revoltosa, the tension between the characters resolves into harmony. Ms. Tonna and Mr. Rosa were outstanding.Ms. Tonna was equally impressive singing an aria of gratitude "Dejame besar tus manos generosas" from Jose Serrano's La Dolorosa, with Mr. Borrallo. This tenor was exquisite in "Por el humo se sabe donde esta el fuego" from Amadeo Vives' Dona Francisquita. No matter how rhythmic the accompaniment is, he maintains a fine legato and noticeable artistry in the melismatic passages. His tender timbre was just right for "Bella enamorada" from Soutullo y Vert's El Ultimo Romantico. Ms. D'Imperio gave a stunning performance of "La maja y el ruisenor" from Enrique Granados' Goyescas. Mr. Anikushin's piano made the sound of the nightingale as beautiful as birdsong. Her performance captivated the audience. Mr. Rosa's generous baritone was just right for "Diga usted Senor platero" from Francisco Alonso's La Parranda. He knows just when and how long to hold the "money note" and how to make a graceful portamento. We liked the way he changed vocal colors for the central section and the final crescendo. It was truly an incredible afternoon! Audience members were so enthusiastic that several numbers got standing ovations. One rarely witnesses such excitement and appreciation at a vocal recital. Our admiration for Daniel Cardona's hard work knows no bounds. 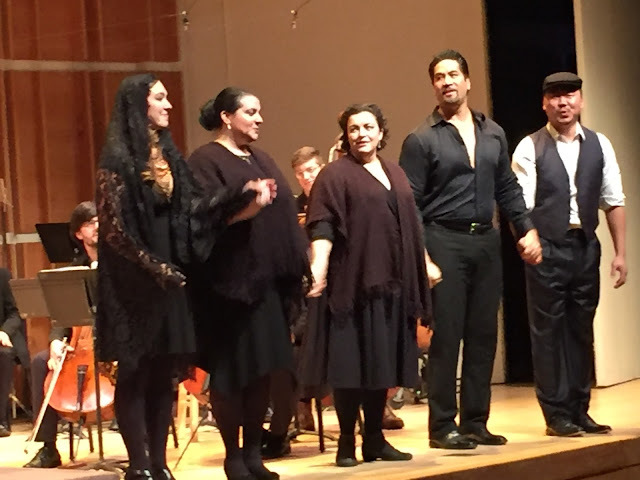 He has assembled a group of superb singers and a fine orchestra, led last night by Maestro Gregory Buchalter, and presented a semi-staged performance of Pietro Mascagni's powerful opera Cavalleria Rusticana that is not likely to be equalled. Since The Metropolitan Opera carelessly and thoughtlessly discarded their gorgeous production of this opera (substituting a sadly stripped down minimalistic production) we had given up hopes of enjoying this 1890 verismo masterpiece. But last night, by dint of powerful voices conveying all that Sicilian passione, we were able to experience the story in a more powerful and intimate manner. The story is most affecting--it takes place on Easter morning in a small Sicilian village and involves a love triangle. Santuzza, movingly sung by Ann Quintero, is in love with the faithless Turridu, powerfully sung by tenor Ta'u Pupu'a (in better voice than we have ever heard him). He has seduced her and she has been excommunicated because of this "sin". But he has abandoned her and returned to his old love Lola (mezzo-soprano Natalie Rose Havens) who is married to the carter Alfio (the wonderful baritone SeungHyeon Baek). Turridu's mother, sung magnificently by Janara Kellerman, was here portrayed as quite sympathetic toward Santuzza which contributed to the audience's sympathy toward her. The story plays out in accordance with the customs of that epoch and that part of the world, in which "honor" is everything--leading to a tragic conclusion. No wonder that the judges of the one-act opera competition awarded Mascagni the coveted prize! No wonder that the critics and audience went wild at the Rome premiere. Merkin Hall at the Kaufman Music Center has great sight-lines but no orchestra pit. 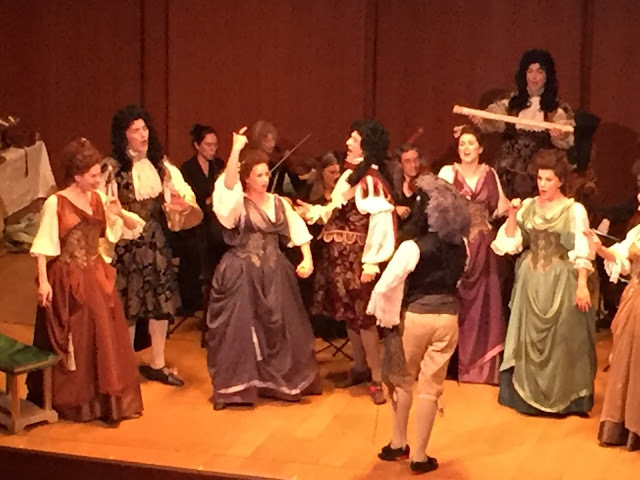 Maestro Buchalter and the excellent Martha Cardona Opera Orchestra occupied the stage while the singers used the narrow strip of real estate downstage, as well as the aisles. It all worked out just fine since all the singers are excellent actors and interacted in dramatically valid ways. There were powerful scenes between Santuzza and Mamma Lucia, between Santuzza and Turridu, between Turridu and Mamma, and between Turridu and Alfio. There was not a wrong "note" anywhere and nothing to criticize. The Italian was so clear and so well projected over the orchestra that nothing got lost, even when the recalcitrant titles failed. The orchestra played exceptionally well for Maestro Buchalter. The introduction set the scene with its luscious melody and the Maestro achieving impressive clarity. The string section lay down a thick carpet of sound and the harpist (Melanie Genin) achieved a predominance in the introduction. We would like to acknowledge all the fine musicians who contributed to the memorable intermezzo. Jesse Pieper's electronic organ was impressive. Notable solos by flutist Katie Barbo and oboist Mark Sophia were heard, among others. Apologies to those we haven't mentioned by name! The chorus of village folk not only sang well but participated in the action. Kudos to whoever directed the activity but went uncredited in the program. David O. Roberts was responsible for the simple costuming. Wisely, he put everyone in black as befit the time and place. The men wore hats; the women covered their heads. The Martha Cardona Opera has come a long way since we have been writing about them. Daniel Cardona always puts on a fine show but last night he outdid himself. Everything came together beautifully. He accomplishes all this at a modest ticket cost and depends upon your tax-deductible contributions to make up the shortfall. We would love to see what he could do with a budget large enough to have a theater with an orchestra pit and some scenery. In the meanwhile, we have no complaints. This performance will stay in our memory as a landmark. In September we wrote about a private recital in which baritone Robert Osborne sang a number of unpublished songs by Franz Waxman. We are delighted to report that the songs will be published and that Mr. Osborne has recorded them under the title "Who Wants Love?" We were so impressed by his performance that we jumped at the chance to hear more. Last night he performed them at the cabaret held at Cafe Sabarsky of Neue Galerie. Franz Waxman can be said to have led three lives. He began composing in his native Germany and orchestrated Frederick Hollander's score for "The Blue Angel". He fled the Nazis in 1934. and lived in Paris for nearly a year where he continued to compose. Then he got an offer he couldn't refuse from Hollywood where he spent the rest of his life as a successful composer of film scores, his first one being "Bride of Frankenstein" in 1935. There would be 143 more! Those familiar with his Academy Awards for "Sunset Boulevard" and "A Place in the Sun" may not even know of his vast legacy of cabaret songs and we are grateful to Mr. Osborne for bringing them to our attention. Accompanied by Richard Gordon on the piano, Mr. Osborne sang them as only a true aficionado could, capturing every ironic nuance, every enthusiastic joy, every crumb of despair. And he sang them in fine French and German and English. He is every bit as adaptable as the composer. He is a superb actor and uses his expressive face and body to augment the expressiveness of his voice. He has many colors in his vocal palette and makes use of them all. He is also an excellent narrator and shared nuggets of information about each song. There were funny songs about taxes and the financial crisis, sad songs about loneliness, optimistic songs about love, and jolly devilish songs sung with a twinkle in his eye. Not only are the vocal lines melodic and singable but the writing for piano is filled with interesting riffs and harmonies. Mr. Gordon is just the right collaborative pianist for Project Waxman! We especially enjoyed one about impoverished bohemians feeling wealthy because of the young women of Montparnasse. Whatever language Waxman wrote in and Osborne sang in, the text and music match up like wurst and senf. The title song of the new CD "Who Wants Love" came from a film entitled "The Bride Wore Red" and was recorded by Billie Holiday. This is a CD you will want to add to your collection! Wonderful entertainment and the sharing of good food and wine sounds like a perfect evening and a good way to assuage political disappointment. We cling to the arts to remedy the ugliness of everyday life. On Planet Opera, "Tout est luxe, calme et volupté". Baudelaire wrote it (Les Fleurs du Mal), Duparc set it to music, and Matisse painted it. Last night at the annual membership party of Opera Index, we lived it. Too bad no one sang "L'invitation au voyage" ! 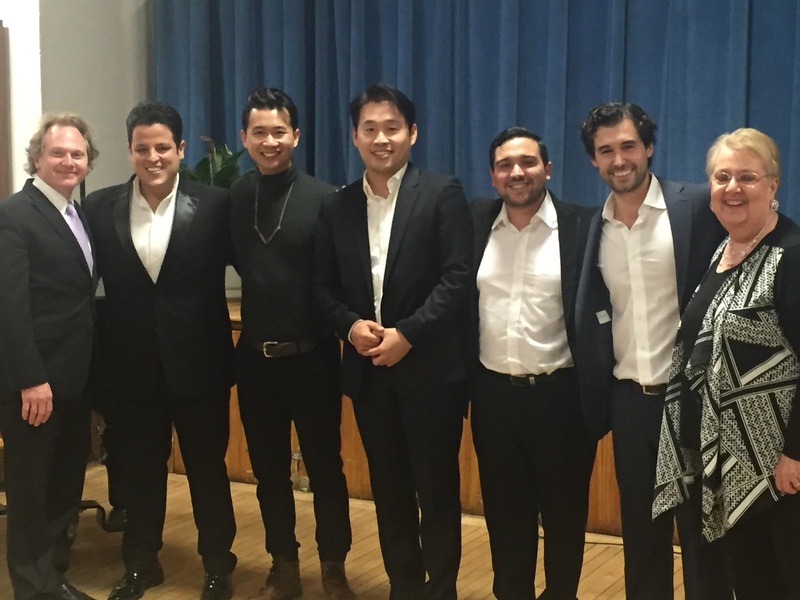 After some welcoming words by President Jane Shaulis (yes, a most effective female president) we members were serenaded by five handsome charming young artists. The annual vocal competition is quite a big deal. It took a panel of 3 to winnow the 300 applicants down to 91 singers and a couple days of auditioning to further get the list down to 27 finalists. A new panel of judges selected the final 16 award recipients. As is our wont, we do not offer the rankings or tell how the $55,000. was distributed. All we are willing to share with our readers is that our dearest wish is to see these talented tenors and brilliant baritones become as famous as prior winners--among whom we notice the names of many world renowned singers. But let's get to the entertainment! We had a round of opera arias followed by a round of more lighthearted songs, so that each singer's versatility was showcased. We have noticed a procession of gifted singers coming from Mexico (NO WALL, PLEASE!) and tenor Andrés Moreno Garcia ranks among the best. He sang Alfredo's second act aria from Verdi's La Traviata--"De miei bollenti spiriti" and he sang it with all the exuberant spirits of a young man in love. His instrument has a sound full of amplitude and resonance with good variety of dynamics and just the right rubato. He is filled to the brim with Latin passion and, for his second selection, gave a marvelous reading of "No puede ser" from La tabernera del puerto by Pablo Sorozábal. Even if you've never seen that zarzuela, you have heard several famous tenors offer this intense crowd-pleaser. Tenor Alexander McKissick chose an aria from Puccini's first stage work (1883), the opera/ballet Le villi. In "Torna ai felici di", the hero mourns the loss of his youth, before he was seduced by one of those mittel-Europa sirens. Mr. McKissick conveyed Roberto's anguish vocally, with an economy of gesture, and built the work to an intense climax. His lighter side was given an opportunity to shine in "You and the Night and the Music", the Arthur Schwartz song (lyrics by Howard Dietz) composed for the 1934 Broadway show Revenge with Music. Mr. McKissick sure has what it takes to be on Broadway if he chose that pathway. Mr. Delgado has thrilled us on a couple of occasions with his zarzuela singing. As a matter of fact we well remember his singing "No puede ser" a couple years ago! But last night he surprised us by singing in German--"Dein ist mein ganzes Herz" the hit song from Franz Lehár's Das Land des Lächelns. His manner was warm and expressive and his German totally understandable. As far as the baritones we heard, both were superb. It seems as if SeokJung Baek is everywhere. And no wonder! He is a fine and versatile artist with a beautiful instrument. His selection was "Avant de quitter ces lieux" from Gounod's Faust which he sang in fine French with appropriate variation of vocal color in the second section. His second selection was the very same Tosti song we heard him sing a couple days ago--"L'alba separa dalla luce l'ombra". Truly, we cannot get enough of this fine performance. We have been listening to recordings of it for the past few days. The second baritone Brian Vu is truly a stage animal. He used his entire body to convey the expansive personality of Rossini's creation--the barber Figaro--in "Largo al factotum". Mr. Vu's stage personality is so much larger than life that one might overlook the fact that his voice is so outstanding. His second selection was equally impressive--"Johanna" from Sondheim's Sweeney Todd, sung with all the ardency of the character of Anthony Hope, the young sailor who loves Sweeney's daughter. We would have to agree with Schuyler Chapin (former general manager of The Metropolitan Opera) that this work is an opera. We'd love to see it in an opera house and would absolutely love to hear Mr. Vu in the role. As a final number, all five singers joined voices for a rousing and jovially competitive version of "O Sole Mio", Eduardo di Capua's 1898 Neapolitan song. We have heard it sung by a group before but don't recall enjoying it as much as we did last night. Michael Fennelly was the accompanist for the evening and was just as excellent as he always is. With artistic appetites sated, awards were distributed and members headed for the buffet table which was laden with delights brought by the members themselves. It would appear that those who love singing also love food! Now, with all appetites sated, who could even think of the day's distress and disappointment. We all left smiling! This was a master class like no other. 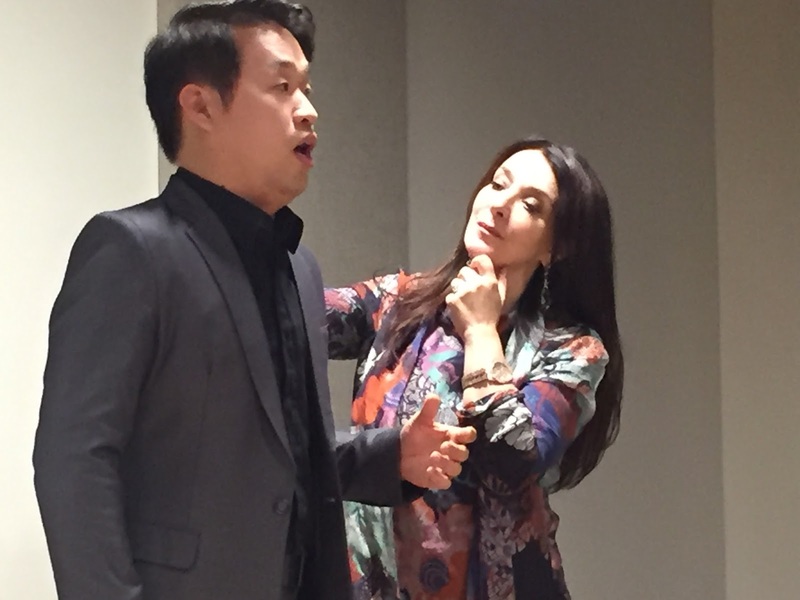 Italian soprano Donata D'Annunzio Lombardi spent three hours coaching nine young singers in a class devoted to songs by Francesco Paolo Tosti to commemorate the centennial year of his death. Each singer prepared a song (some familiar and some lesser known) and Ms. Lombardi proceeded to use her unique knowledge of anatomy to transform each singer. Had you been there you would not scoff at this extravagant assertion. She uses various stances and poses to bypass the throat tension that she observes in American singers (although she admits that American singers are far more expressive than their Italian counterparts). This made us wonder whether the English language itself produces this throat tension; we must ask Ms. Lombardi! The wildest claim she made is that tenors come in two varieties--"the hitchhiker" and "the communist". The former holds the fingers down with the thumb sticking out, like Carreras; the latter holds his hands in a fist like Pavarotti. She avers that the thumb is connected with the intellect and the index finger with the front of the body. She wants the singer to use the back of the body--the rear attachment of the diaphragm, the musculature of the spine, and the tentorium of the brain at the back of the skull. To our great surprise, we noticed an amazing difference when the singer touched his thumb to the pinkie, which is connected to the back of the body! She stressed the importance of flexibility and spring and had many of the students stand on a bent leg while flexing and extending the other leg. This too made a difference! So did leaning over to one side. The spine provides an anchor for the sound. The bent over posture mimics that of Early Man--a natural sound emerges in these positions. And we always believed that singers must stand erect with shoulders down and back to open the chest. Now we know there is a better but counter-intuitive way. Rounding the shoulders like Maria Callas opens the length of the spine. Breathing must come through the back! There were also various exercises to free up the vocal chords and spaces in the head. Students were instructed to hold their lips or bite down on one side, lest the orbicular muscles block the larynx. So much of this advice goes against the way American singers have been taught but if you had been there, you would have heard the evidence with your own ears! The singers comprised sopranos Angela Candela, Elizabeth Perez, and Vivian Yau (the latter two heard at the CLA Gala), tenors Ganson Salmon, Chul Young Kim, Michael St. Peter, and HyunHo Cho, and baritones Sunyeop Hwang and Seok Jong Baek. Each one made a major leap forward. Glenn Morton (Founder of Classic Lyric Arts, teacher, and coach) was the accompanist for the class which was held at Mannes School of Music. We have enjoyed and written about soprano Susanna Phillips for a few years, having been particularly delighted by her superb portrayal of The Countess in Le Nozze di Figaro at the Santa Fe Opera. 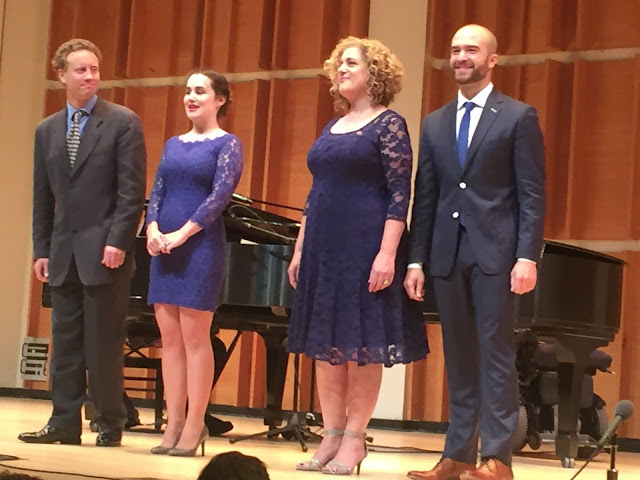 There have been two prior recitals as well--one 3 1/2 years ago at Weill Recital Hall and another shortly afterward at The Morgan Library, as part of the George London Foundation vocal series. Yesterday at Zankel Hall, Ms. Phillips carried the afternoon recital by herself, Eric Owens having canceled due to illness. When all is said and done we have formed the opinion that Ms. Phillips comes across best when she has something dramatic to work with, be it opera or a dramatic song, There is nothing wrong with her recitals (except an inconsistency with the final consonants in German and the nasal vowels of French); it's just a lack of excitement that we hear in her operatic performances. In yesterday's recital at Zankel Hall, the excitement came and went along with the vocal colors of any particular song. The heavy drama of Schubert's "Gretchen am Spinnrade" (thanks to a text by Goethe) brought out the soprano's palette of colors as she built to an intensity of desire. Similarly, in comedic songs, her dramatic ability was put to good advantage. The irony of "Die Männer sind méchant", from the same set by Schubert, came through loud and clear. The lengthy "Viola" tells the story of the tiny violet which blooms early at the behest of the snowdrop and is left waiting at the altar for her bridegroom Spring who has yet to arrive. The metaphor is intense and Ms. Phillips captured it well with exceptional beauty, especially the verse in which the violet realizes she is alone. The lighthearted "Dans un bois solitaire" by Mozart was marked by lovely French phrasing, if not perfect pronunciation of the nasal vowels. Grétry's "Certain coucou" from Le Jugement de Midas is a familiar tale to those who have heard the Mahler version. Ms. Phillips had a great time with this song, hooting like the owl, braying like the donkey, chirping like the cuckoo, and finally dazzling us with the glorious embellishments of the ignored nightingale. We have heard her perform this before and were thrilled to hear it again. The intensely dramatic "Plaisir d'amour" by Martini also received a good variety of color and dynamics with a supremely delicate decrescendo at the end and some very sweet pianism from Myra Huang. While we are at it, let us praise Ms. Huang's superb accompaniment. She has the light touch that we favor but never fades into the background. We heard a quartet of songs by Fauré noted for their delicacy and some lovely melismatic singing in "Après un rêve". The final piece on the program was "Der Hirt auf dem Felsen", one of our favorite pieces. Clarinetist Alicia Lee joined Ms. Phillips and Ms. Huang and the plenitude of tunes bounced back and forth. The wide skips imitate yodeling and did not daunt our intrepid soprano. In the final verse, the change of mood as Spring is arriving was a perfectly joyful place to end the recital. But there was an encore--a piece Ms. Phillips has performed before, one which puts her dramatic skills to good use. In Do You Sing, Mr. Twain? Gordon Myers set eight pithy aphorisms, although one of them "On Rules of Writing", was anything but pithy. With consummate irony, brevity is praised while the pianism and vocalism become increasingly florid with extended passages suggestive of Händel and Donizetti. The two artists had a great time, as did the audience. There are so many components to great singing beyond a great voice. Singers invest so much effort into refining their vocal technique and studying the text and learning how to make contact with the audience. We have enormous respect for the amount of study and dedication that goes into the art of singing. There is a final element that puts the finishing touch on a singer's performance and that is the ease of singing in a foreign language. This ease comes from connection with the language, culture, history and even the food of another culture. It is one thing to learn a text phonetically but a much different thing to grasp the rhythm of a language and how a good text works together with the music. (This is one of the main reasons that we don't enjoy foreign language operas presented in English). Classic Lyric Arts can be thought of as a "finishing school" for singers. Those who are fortunate enough to be accepted to L'Art du Chant Français in France or La Lingua della Lirica in Italy are the cream of the crop of young singers and end their foreign sojourns with icing on their vocal cake. At the gala Monday night, held at the Kosciuszko Foundation, we heard the results and they were mighty impressive. President Glenn Morton gave an eloquent speech about the moments of bliss we all experience at the opera and the challenge of melding song and syntax. The entertainment portion of the evening began with a sextet from Mozart's Cosi fan tutte. We loved the ensemble spirit that was likely engendered by studying together at La Lingua della Lirica. We heard Angela Joy Lamb, Maria Miller, Michelle Geffner, John Haney, Xiaoxiao Cheng, and Andrew Jurden with Brianna Han accompanying on the piano. Mezzo-soprano Zoey Preston delighted us with "Ah quel diner je viens de faire" from Offenbach's La Périchole. We have reviewed this aria three times in as many months and it has become our favorite comic aria. Ms. Preston must have been drunk on champagne (well, we mean the character she portrayed) because she was effervescent. Michael Stewart accompanied. The love duet from Verdi's Falstaff ("Labbra di foco") was sung by the sparkly soprano Hee So Son as Nanetta and the aforementioned tenor John Haney as the young Fenton. They were charming together as their voices intertwined. Michael Sheetz accompanied. 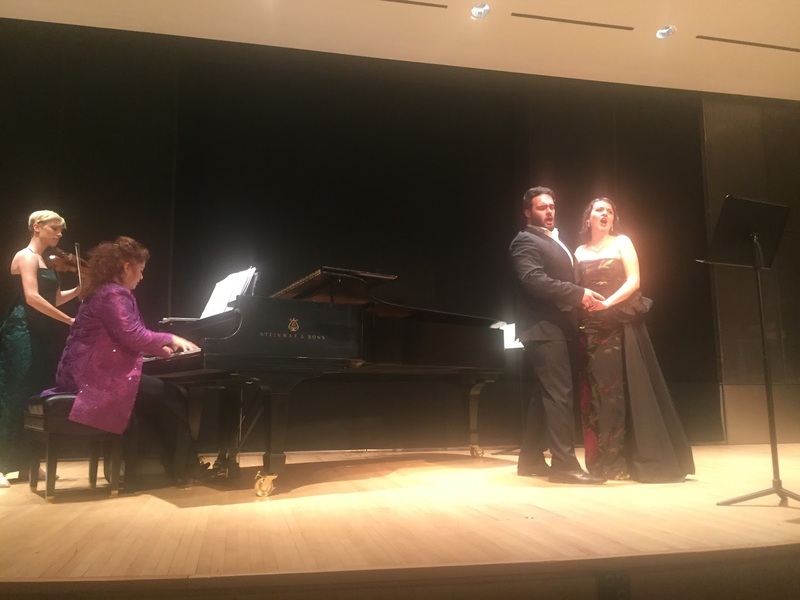 Michael Stewart was the accompanist for mezzo-soprano Vera Kremers who gave a self-contained performance of "La paix du cloître" from Février's Gismonda, an aria to which we were happy to be introduced. Ms. Kremers has a pleasing vibrato and a lovely brilliant upper register. The final quartet from Verdi's Rigoletto was performed by four excellent singers with Michael Sheetz at the piano. 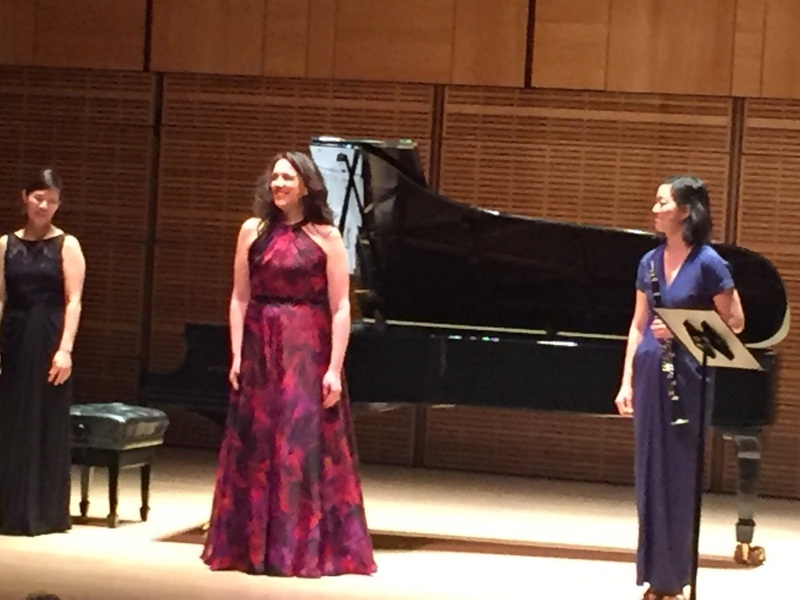 On one side we had baritone Xiaoxiao Cheng as the eponymous hunchback, consoling Elizabeth Perez' Gilda, while tenor Fanyong Du as the Duke was flirting with mezzo-soprano Maria Miller as Maddalena. The acting was as effective as the singing. Tenor Stéphane Sénéchal, a faculty member whom we have reviewed recently, sang the role of the Chevalier Des Grieux whose commitment to the priesthood falls to the blandishments of the beautiful seductive Manon, sung by the beautiful and seductive Mikaela Bennett (whom no one could resist) in "N'est-ce plus ma main" from Massenet's Manon. Mr. Stewart's piano added to the intensity. Mr. Stewart switched gears for the frivolous accompaniment to the Delibes song "Les filles de Cadix" which soprano Vivian Yau performed with plenty of sazón in her gestures. Faculty member Donata D'Annunzio Lombardi blew us away with her performance of Tosti's "Vorrei morire", accompanied by Mr. Morton himself on the piano. The wellspring of feeling came from deep inside. She felt it; we felt it! That was a tough act to follow but fortunately Ms. Lamb made a fine Thaïs for baritone Fernando Cisneros' Athanaël in "Te souvient-il du lumineux voyage" from the Massenet opera. The final number was from Puccini's La Rondine--"Bevo al tuo fresco sorriso". 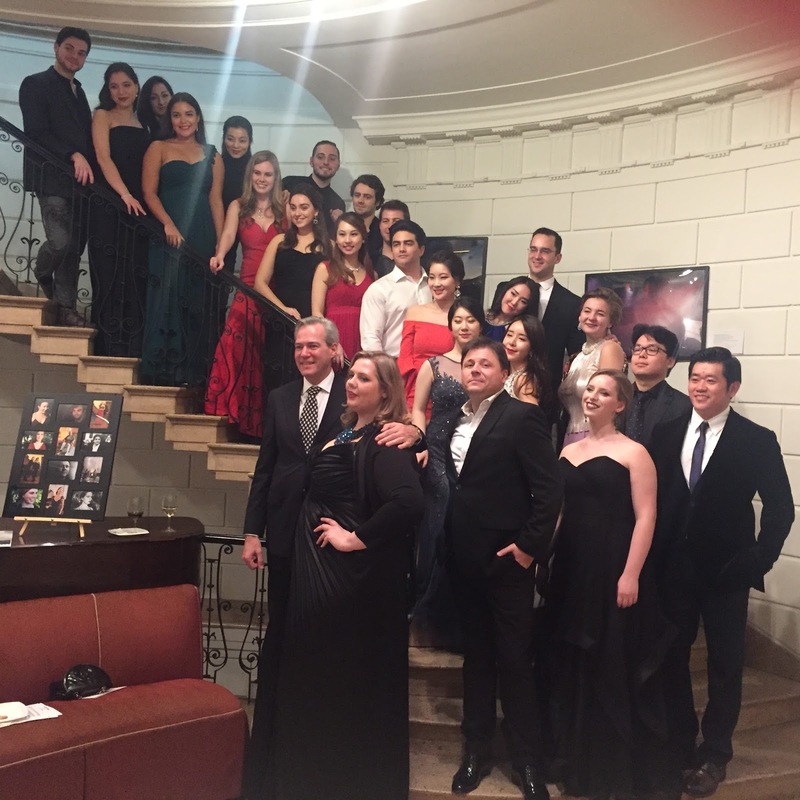 Laetitia Ruccolo took over the piano and Mr. Sheetz conducted the chorus comprising participants of CLA Italy 2016 with lead roles being sung by Yeon Jung Lee, Ms. Perez, Sungwook Kim, and Mr. Haney. The singers we heard enchanted us and served as terrific testimonials to the value of the programs. It is impressive to hear such communication through language layered onto the marvelous musical values. They made every phrase count! Count on Steven Blier to assemble a gifted group of singers who are comfortable with genres from classical art song to Broadway to the Beatles. Count on Steven Blier to dream up a thrilling theme. Count on Steven Blier to curate enough songs to fill out the theme. Count on Steven Blier to titillate the audience with tidbits about the composers. Count on Steven Blier to tickle the ivories and your ears with his arranging and playing. And count on Steven Blier to write a fascinating essay about the program, instead of the customary boring program notes. The theme of last night's concert at Merkin Concert Hall was "Rodgers, Rogers & Guettel"; three generations of America's own musical dynasty. The first set of songs illustrated Richard Rodgers partnership with Lorenz Hart as lyricist and were composed in the 1920's and 1930's. Our personal favorite of this group was "Maybe It's Me" from the 1926 musical Peggy-Ann. 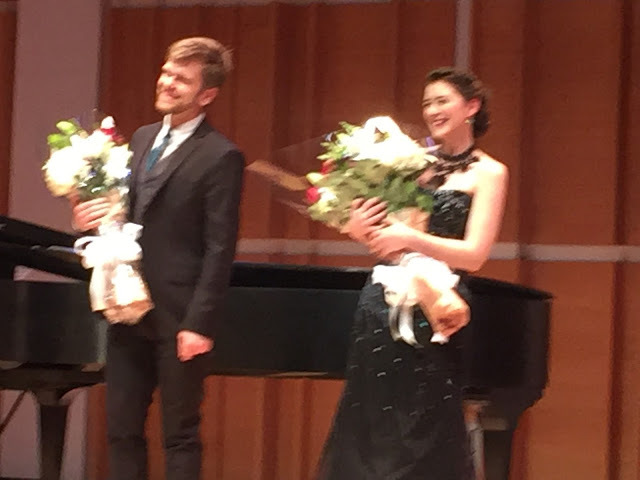 We loved soprano Lauren Worsham's charming style and were delighted by Mr. Hart's clever rhymes (i.e. senator/progenitor). In the 1940's, Mr. Rodgers produced some of his finest music in collaboration with lyricist Oscar Hammerstein II. Mezzo-soprano Mary Testa sang the insightful "The Gentleman Is a Dope" which reminded us of how we tend to disparage what we cannot achieve. Baritone John Brancy performed "Some Enchanted Evening" in a highly personal fashion that enchanted us, pouring that old wine into some new flavorful oak barrels, adding nuance upon nuance. Mr. Rodgers collaborated with Stephen Sondheim in the 60's and "Bargaining" from Do I Hear a Waltz? 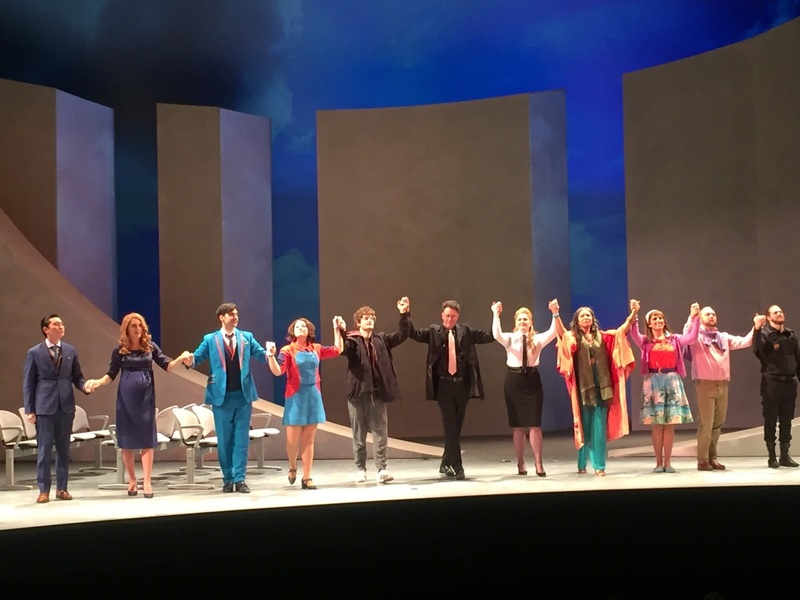 with it's humorous and clever lyrics was well performed by tenor Hal Cazalet. Mary Rodgers, Richard's daughter, wrote some fine music in the 60's and last night's program included a number of them that had gone unpublished for one reason or another. She is better known today as a writer of children's books but it was a real gift from NYFOS to share these songs with us. She died just two years ago. One of the songs was familiar to us--"The Boy From...." with hilarious lyrics by Mr. Sondheim; it was part of a revue called The Mad Show and may have been a send-up of a song "The Girl from Ipanema". Ms. Testa is at her best in comedy and everything about her delivery was on point. Ms. Rogers also worked with lyricist Marshall Barer on a musical called Once Upon a Mattress. "Happily Ever After" was delightfully performed by Ms. Testa, Mr. Cazalet, and Mr. Brancy. This satire of fairy tales made us think of Sondheim's Into the Woods which appeared in 1986. The third member of the family to be honored by NYFOS was Ms. Rogers' son Adam Guettel, whose music is very much of our time, melding influences from several genres and time periods. Ms. Worsham was absolutely charming as Clara from Light in the Piazza singing the title song of Mr. Guettels's 2003 musical. An earlier work from his 1998 Myths and Hymns, entitled "Awaiting You" was sung by Mr. Brancy who employed all manner of vocal colors and dynamic variety. The writing for piano was particularly complex and turbulent. Mr. Blier's essay about the Rodgers clan touched upon the many problems of this musical dynasty but we prefer to focus on the musical gifts they have given to us. We understand that Mr. Guettel married just two years ago so it's a bit too soon to know if the family gift will be perpetuated!